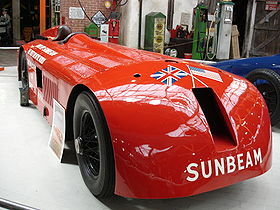 Sunbeam 1000HP at National Motor Museum in Beaulieu, UK. Photograph by David Hunt. Sunbeam Motor Car Company Limited was headquartered in Wolverhampton, England, and the car was the only unit of the design, specifically made for the world record run. Although relatively sleek and aerodynamic looking for the time, the car was quite large, stretching 25 feet long and 8 feet wide, while weighing a whopping 4 tons! Designed by Captain Jack Irving and Louis Coatalen for Coatalen’s Automobiles Talbot-Darracq team, limited money kept new development to a minimum, hence the use of used engines. The tires (again, for you Anglophiles, “tyres”) were custom made to withstand a speed of at least 200 mph for 3 and a half minutes. Segrave at the Grand Prix Sunbeams 1921, 1922 TT. Photograph by Agence Rol. Getting back to the car, the engines were not just cranked up with the usual hand crank or the electric self-starter. The rear engine was started using compressed air to turn it over, and once it started, the rear engine was used to start the front engine via a friction clutch. Once they were both running, the engines were synchronized and then locked together with a “dog clutch.” The Sunbeam Motor Company made automobiles from 1901 until it went out of business in 1967, although the brand name lived on until 1976. Chrysler and its European affiliate also used the Sunbeam name for a while (1977-1982), but as a model name rather than a brand. The company also manufactured aircraft and watercraft engines, commercial vehicles, motorcycles and both sports cars and sedans, as well as race cars. Questions for Students (and others): Do you know what the current Land Speed Record is? Have you ever been to Daytona Beach, Florida? What is the fastest car you have ever owned or driven? Please let us know in the comments section below this article. 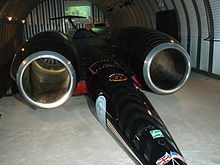 ThrustSSC, driven by Royal Air Force pilot Andy Green, holds the land speed record. Photograph by AJB83 at English Wikipedia. Posthumus, Cyril. Sir Henry Segrave. Batsford, 1961. Ross, Frank, Jr. Car Racing Against the Clock: The Story of the World Land Speed Record. Lothrop, Lee & Shepard Co, 1976. Segrave, Sir Henry. The Lure of Speed. Hutchinson & Co. Ltd., 1932. It is the recording of an audiovisual or musical work already in the public domain, and more than 50 years have passed since the performance or the recording (CPI art. L211-4). Previous ArticleWhen Did Terrorists Start Taking Down Airliners? Next Article Why Do We Have Daylight Saving Time?